Alaskan Air Conditioning & Heating’s Technicians: The Best of the Best! Expert technicians are hard to find and we are very fortunate to have as many as we do. Alaskan Air Conditioning & Heating technicians are the best in the business! Without them, we risk not providing you with the service and installation you expect…and deserve. That is a risk we are not willing to take. Our technicians demonstrate their superior knowledge of today’s sophisticated HVAC systems by solving the most difficult problems on all makes and models of heating and air conditioning equipment. And, our technicians remain up-to-date with ever- changing and improving technologies by continuing their industry education and training on a consistent basis. Our customers can rest assured that with an Alaskan Air Conditioning & Heating technician on the job that they are getting the best installation and service for maximum comfort and efficiency from their heating and cooling system. Furthermore, better installation and service means a longer life for your heating and cooling equipment! a job done right the first time! 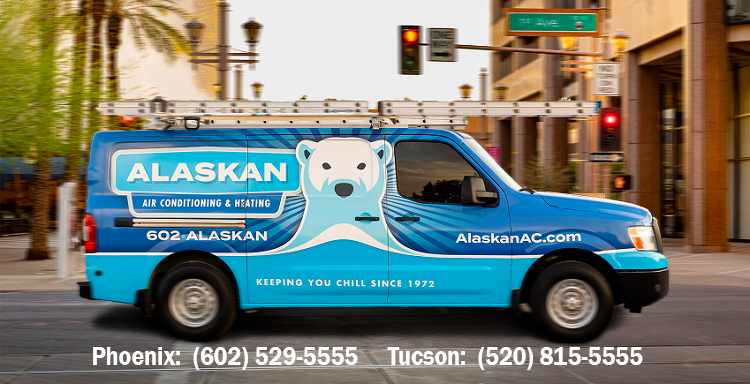 Phoenix and Tucson homeowners know that Alaskan Air Conditioning & Heating stands for excellence and quality sales and service and that is what you get EVERYTIME you call us for a cooling repair! It’s what makes us different; it’s what makes us better! If you reside in the Phoenix or Tucson areas and you want the best service team available in our area, call Alaskan Air Conditioning & Heating. Call in Phoenix: 602-529-5555 or in Tucson: 520-815-5555 to schedule your service or free new system estimate today. By Denise Tudor|2018-08-28T16:45:55+00:00August 28th, 2018|Uncategorized|Comments Off on Alaskan Air Conditioning & Heating’s Technicians: The Best of the Best!